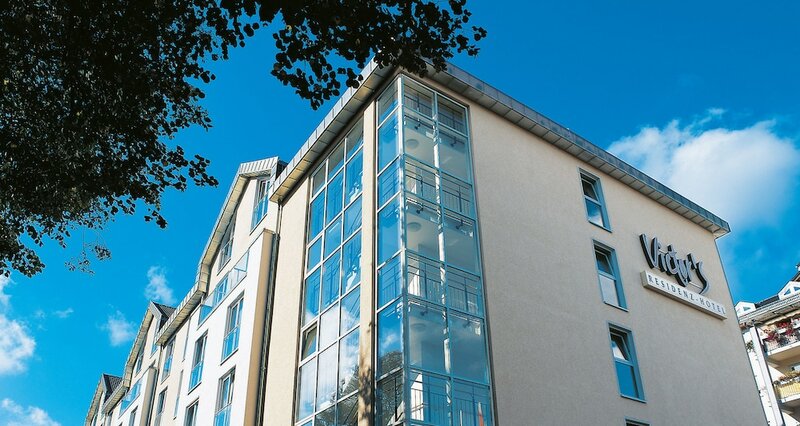 A stay at Victor's Residenz-Hotel Gummersbach places you in the heart of Gummersbach, within a 5-minute drive of Vogteihaus and Gumbala Water Park. This 4-star hotel is 3.9 mi (6.3 km) from Dieringhausen Railway Museum and 4.5 mi (7.2 km) from Aggertalsperre. Stay in one of 89 guestrooms featuring LCD televisions. Complimentary wireless Internet access keeps you connected, and satellite programming is available for your entertainment. Private bathrooms with showers feature complimentary toiletries and hair dryers. Conveniences include safes and desks, as well as phones with free international calls. Take in the views from a terrace and make use of amenities such as complimentary wireless Internet access and shopping on site. This hotel also features a television in a common area, tour/ticket assistance, and a ballroom. Enjoy a meal at the restaurant, or stay in and take advantage of the hotel's room service (during limited hours). Wrap up your day with a drink at the bar/lounge. Buffet breakfasts are served on weekdays from 6:30 AM to 10 AM and on weekends from 7 AM to 11 AM for a fee. Featured amenities include a business center, express check-in, and express check-out. Planning an event in Gummersbach? This hotel has facilities measuring 4456 square feet (414 square meters), including a conference center. Free self parking is available onsite.